On Monday, April 4, from 10am to 6pm, The East Village Association is stepping up to the plate for the 6th Annual East Village Opening Day Block Party. Taking over J Street between 6th and 10th Avenues, this free-to-attend, family-friendly event has become a San Diego tradition where locals and visitors celebrate opening day of Padres baseball at PETCO Park, all while exploring San Diego's East Village. Get the first round on us and enter to win 2 drink tickets and read on for all the details. Whether you're attending the game or not, come and root, root, root for the home team as you show off your Padre's pride. Test your skills in the East Village Opening Day Block Party's interactive game zone. In proper San Diego fashion there will be plenty of craft beer flowing in the micro-brew beer garden featuring beers from Stone Brewing, Mission Brewing, and Monkey Paw, as well as craft spirits and cocktails from 619 Vodka and Henebery Whiskey. East Village restaurants and San Diego food trucks will line the streets to satisfy hunger and fuel the spirit for the game, and there will be plenty of live musical performances. The 2016 PETCO Park season opener ballgame will feature the San Diego Padres as they play host to their Southern California rivals - the Los Angeles Dodgers. Tickets for the ballgame must be purchased separately but, whether you make it into the game or not, the Opening Day Block Party will be the place to be to show off your team spirit and send our team into a season of success! 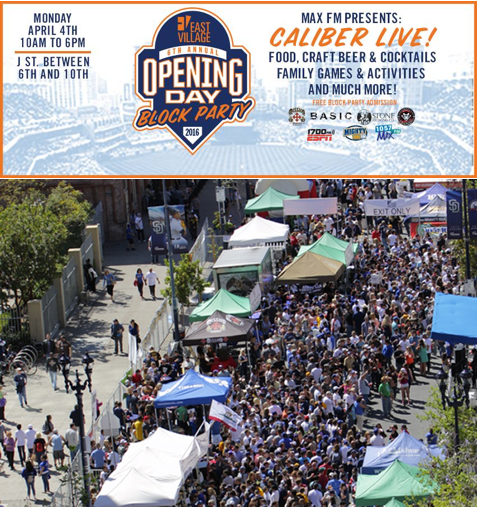 For more information on the 6th Annual East Village Opening Day Block Party, visit EastVillageSanDiego.com or Facebook.com/EastVillageSD. All proceeds from block party sponsorships and exhibitors will benefit the non-profit East Village Association, Inc. whose mission is to support and promote East Village businesses by establishing the community as San Diego's livable urban village.